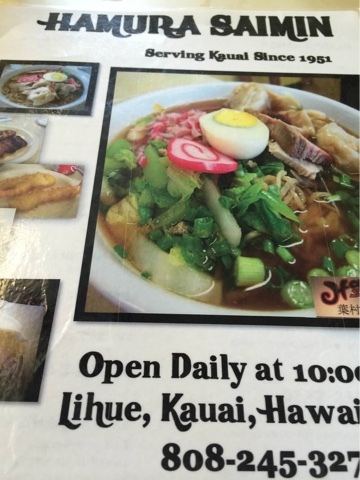 Three people, who do not know each other, recommended Hamura Saimin to us while in Kauai for vacation. Hamura Saimin is a little "hole-in-the-wall" ramen place in Lihue, which is in the same city as the airport we flew into. 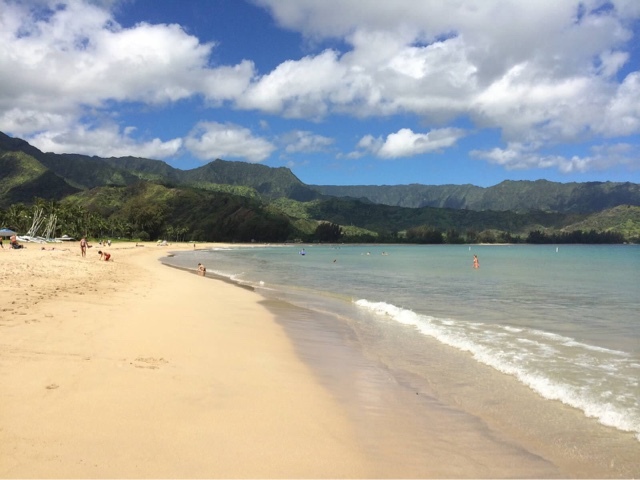 When we flew in, we immediately drove 30 miles to Hanalei in the north shore of the island to meet our family members at the house we rented and did not think to stop first to try the restaurant before the long hour drive. It was not until day three of our vacation that we decided to take a mini road trip back down to Lihue to do some shopping and have lunch at this small popular place. It was the middle of work week so when we arrived it was not busy. The tables are shared, community tables that can sit about up to 10 people. We were able to sit immediately. We noticed as the time passed, there were a lot of people standing around waiting for a table. Because the restaurant is really small, the guests stand really close to you, staring and waiting for us to finish. I tried not to make eye contact with them, haha. M and my two relatives all got the Special saimin ($7.50), which comes with vegetables, won tons, boiled egg, roast pork, fishcake, green onions and chopped ham. 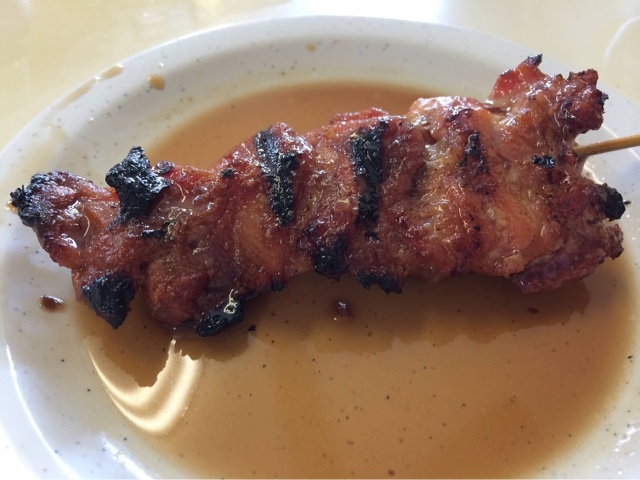 From the Yelp reviews, this dish seemed the most popular of all. 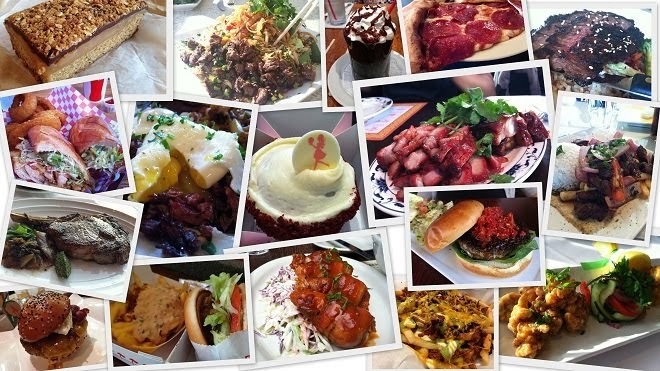 They topped it off with a chili vinegar at the table and stated that the vinegar really enhanced the dish. I was going to share some of my saimin noodles with J, who just turned three last year at that time, so I got him a BBQ chicken stick ($2.00?) for some protein. It was done "yakitori" style on mini sticks. Unfortunately, this chicken was tough and overdone. J only ate a bite and was over it. Okay, here is what I ordered (I always have to be different, right?). 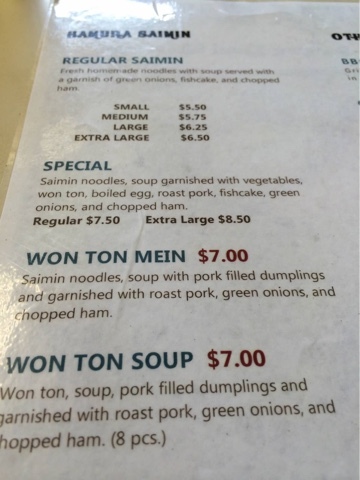 I ordered the Won Ton Mein ($7.00). 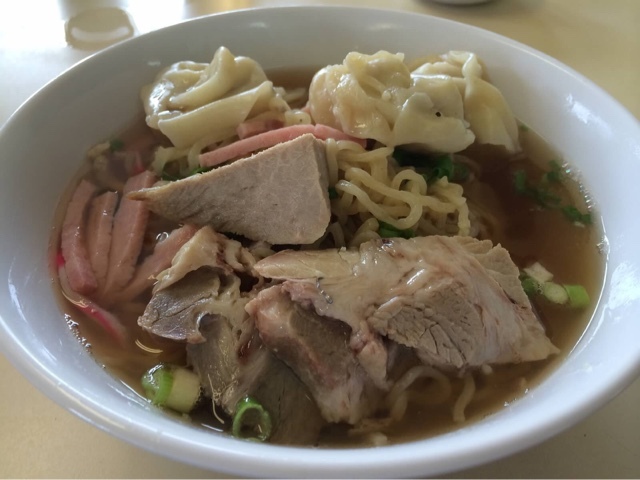 My saimin came with a lot of won ton pieces and a lot of juicy roast pork. Oh, yeah! The broth was really good and flavorful. The noodles were cooked perfectly. The portion of our saimin was HUGE and I think this was a 'medium' bowl. I definitely could not finish the entire bowl, even though I was really hungry too. 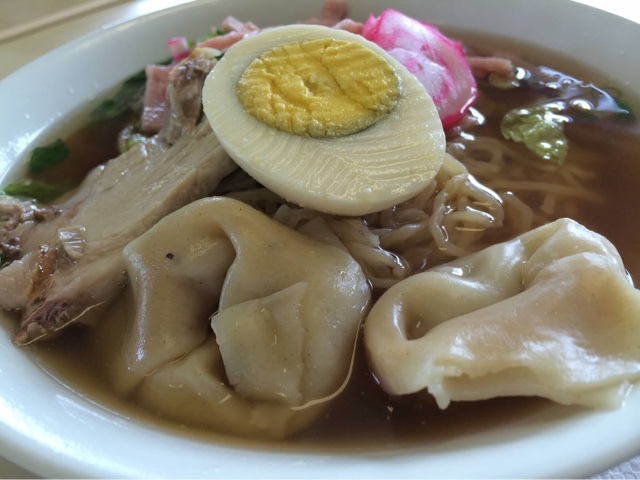 The family in front of us ordered the "regular" saimin, which only comes with chopped ham, green onions, and fishcake, and in two sizes, small and medium. 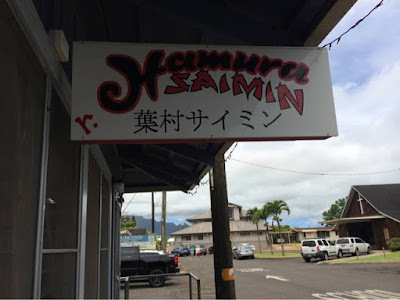 I think next time, I will order a small regular saimin with a side of their yakitori bbq beef, which I didn't get to try. The service is good, not the greatest, because I think they are in the business to get customers in and out very quickly. All in all, Hamura Saimin is a definite place to visit when in Kauai. ORDER the lilikoi chiffon pie. That's a must. P.S.... CASH ONLY!